Yellowstone National Park set a record in July with 980,702 visits for the month, an increase of 14 percent over last July, and a 2 percent increase over the previous July record, which was set in 2010. July is typically the park’s peak visitation month, followed by August, June, September and May. For the first seven months of 2015, the park hosted a record-breaking number of visits totaling 2,279,557, up 17 percent over last year and 13 percent more than the previous record set in 2010, when over 3.6 million people visited the park. Each of the park’s five entrances showed increased visits for the month of July, with the North and West entrances both continuing to record the largest increases. Visitation statistics are calculated by taking the actual number of wheeled vehicles entering the park gates, and using a person-per-vehicle multiplier to calculate the number of monthly visitors. More than 3 million visits to Yellowstone have occurred annually for each of the last eight years. Extending 125 miles up the Missouri River from the Fort Peck Dam in north-central Montana, the Charles M. Russell National Wildlife Refuge stretches across 1.1 million acres and is home to elk year-round. If observing elk in the wild and hearing their shrill call is on your Montana to-do list, then the autumn rut (the breeding season) is the time to go. Each fall, hundreds of elk congregate in the Slippery Ann Wildlife Viewing Area at the refuge, offering an opportunity to view bull and cow elk that have gathered to mate. 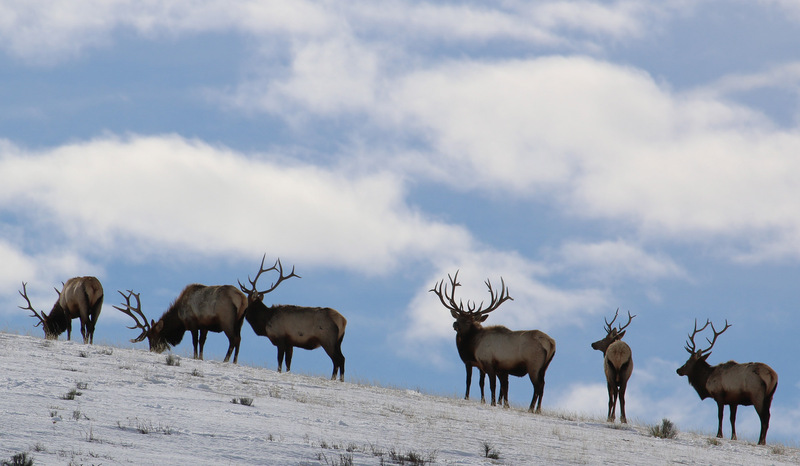 Records from recent years show that nearly 500 elk may visit the area in September, though this can vary from year to year. Numbers continue to remain high through early October, and then decline as the harems (groups of cows) break up and the bulls begin to feed again and store up reserves for the winter ahead. If you don’t catch a lucky bugling break, there are additional spectacular examples of native prairie, forested coulees, river bottoms and badlands that mule deer, pronghorn, bald eagles, bighorn sheep and grouse call home. Given the size and remoteness of the refuge, the area has changed very little since the historic voyage of the Lewis and Clark expedition. Camping is permitted anywhere on the refuge, and it is open to hiking and horseback riding, although no formal trails exist. 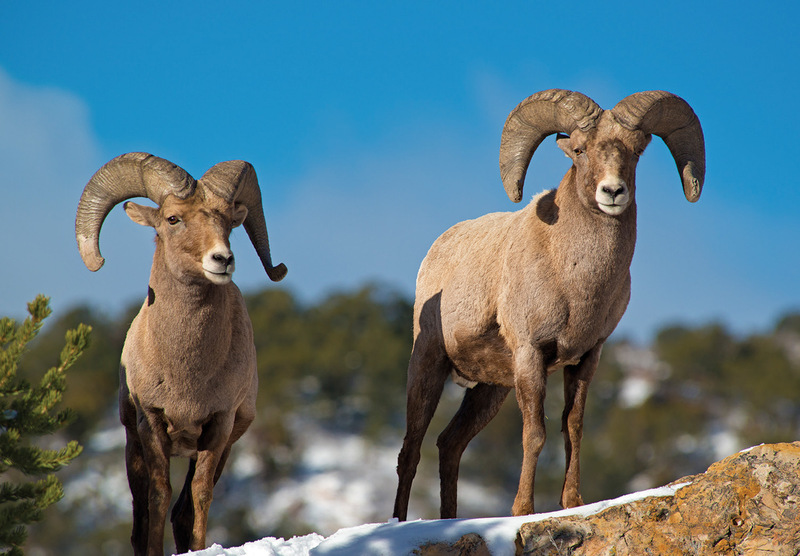 The National Bighorn Sheep Center will host its fundraising gala Nov. 7 in Dubois, Wyoming. This year’s annual Bighorn Bash offers entertainment, food, auction and raffle items, all to benefit the organization’s stewardship and educational efforts. Committed to wild sheep since 1993, the organization’s interpretive center features dioramas that recreate the bighorns’ habitat, interactive exhibits about wildlife management and special adaptations of wild sheep, and wildlife films to educate the public about the biology and habitat needs of the Rocky Mountain Bighorn Sheep. The evening begins with a social hour at 5:30 p.m., followed by dinner at 6:30. Tickets are $35 per person or $65 per couple, and are available by calling the Bighorn Sheep Center. 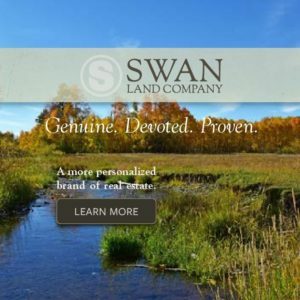 Since 2009, Lars and Jennifer Magnusson of Blixt & Co. have brought the English custom of driven pheasant and partridge shooting to the American West. Taking place at Twin Peaks estate in Idaho, it’s one of the only commercial establishments in North America to offer this type of traditional sporting event. A driven shoot consists of a team of shooters lining up at numbered pegs while a group of beaters and their dogs move through the field at a gamekeeper’s command, flushing game toward the gunmen. The shooters now have unique targets, with the birds flying overhead and toward them, instead of having to walk up on the birds. Trained gun dogs then quickly retrieve the fallen game. The Magnussons host six to seven drives per day, and shooters are assisted by a captain, a personal loader, an English gamekeeper and a team of beaters and dog handlers. A hunt includes breakfast, lunch and afternoon tea or cocktails. Etiquette is an important part of the hunt; participation requires the use of a traditional break barrel gun, English dress and a high-level of sportsman-like conduct. For some Montana sportsmen, it’s traditional to clear out the freezer each fall, making room for the next season’s bounty. In Ennis, Montana, this freezer-clearing rite first spawned a community potluck in 1985, and the practice continues today. The past season’s moose, deer, elk and other wild game meat are used to make chili and other savory dishes once a year before the first day of rifle hunting season. 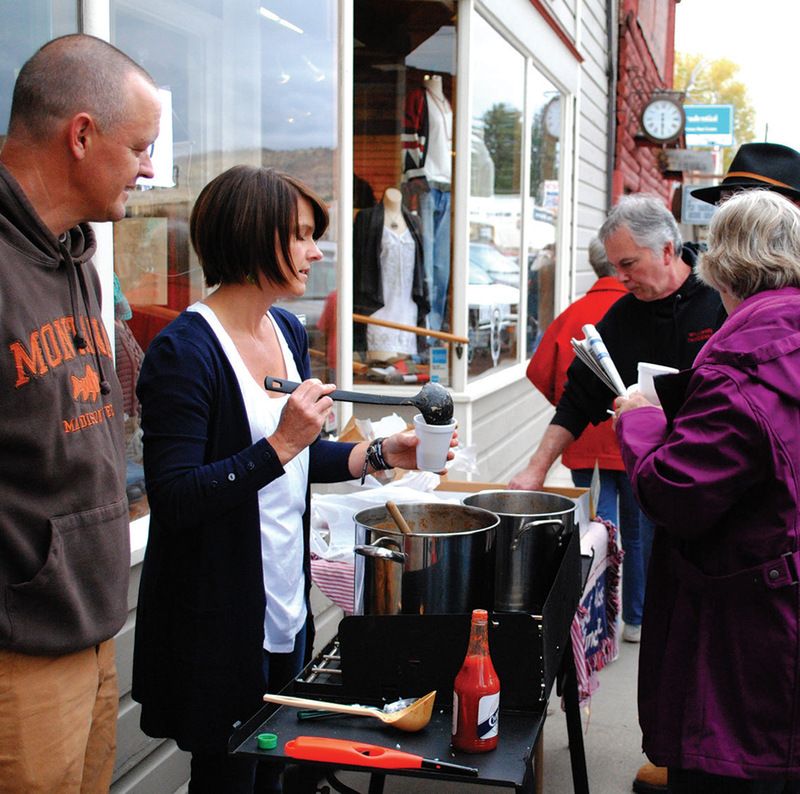 This year’s feast will take place on Oct. 23, from 3 to 5 p.m., with chefs setting up shop along Main Street to serve creations such as elk and deer chili, moose meatballs, antelope and even bobcat. Attendees sample their way along the street for free, voting for the best chili, best non-chili, most unusual and best overall entries as they go. Montana residents and nonresidents can show support and gratitude to members of the military by donating their hunting licenses to a disabled military veteran or disabled active duty service member. Under Montana state law, the disabled veteran or active armed forces member must be working with an organization that uses hunting as part of the rehabilitation process. While one cannot choose which organization will receive a donated license, the disabled veteran or armed forces member who receives the license will be a Purple Heart recipient and have a 70 percent or greater disability rating. Licenses must be donated or surrendered before the beginning of the hunting season. For many Northern Rockies residents, the golden leaves of fall signify one thing: It’s time to prepare for ski season. In anticipation, regional communities organize ski and snowboard swaps, selling new and used gear and clothing with a portion of proceeds benefiting local ski clubs. It’s a great way to reuse, recycle and support organizations that keep our ski teams active and mountains groomed and safe. Bring the gear collecting dust in your garage and find ski swaps at the following locations around Montana, Idaho and Wyoming. Details: Scoot down to West Yellowstone for the Rendezvous Ski Trails annual swap that supports the West Yellowstone Ski Education Foundation. Drop gear off from 4 to 7 p.m. on Friday and pick up unsold goods by Saturday at noon. The swap takes place Saturday, Nov. 14 at 8 a.m. at the Rendezvous Trails trailhead. Details: Powder hounds can drop off gear at the Gallatin County Fairgrounds on Friday, Nov. 6, from 10 a.m. to 7 p.m., then hunt for new stuff the following Saturday and Sunday. It costs $1 to register an item on Friday, $2 Saturday and it’s free on Sunday. Become a member of the Bridger Ski Foundation and get in free and early at 9 a.m. on Saturday. Otherwise, gates open each day at 10 a.m., closing Saturday at 5 p.m. and Sunday at 2 p.m. The foundation gets a 20 percent commission from consignment items sold. Details: Snowbowl and Five Valley Backcountry (formerly Marshall Mountain) ski patrols have organized an annual winter gear swap for 47 years. 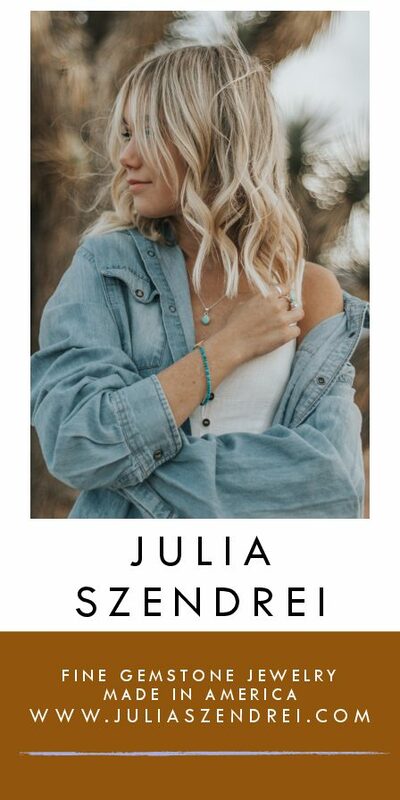 Taking place on Nov. 7 and 8, this year’s swap offers a consignment sale from 9 a.m. to 5 p.m. on Saturday and an open sale from 10 a.m. to 3 p.m. on Sunday at Big Sky High School. Details: Bring your used ski gear to the Wave Aquatic Center on Nov. 6 and 7. Find great deals and recreational gear for all ages. Proceeds benefit the Big Mountain Ski Club’s Learn to Ski Program. Admission is free. Details: This 65th annual ski swap benefits the Bogus Basin Ski Education Foundation and takes place Friday, Nov. 6 through Sunday, Nov. 8, at the Boise fairgrounds. Admission is $3, and equipment drop-off starts Thursday, Nov. 5, at 3 p.m. Doors open at 5 p.m. Friday. The foundation keeps a 25 percent commission from items sold. Details: The 42nd annual ski swap at the College of Southern Idaho kicks off Nov. 20 and 21, bringing equipment and information from area resorts to one location. Register your gear Thursday from noon up until the swap starts at 3 p.m. on Friday. Open until 10 p.m. on Friday and Saturday. Jackson Hole Details: Hosted by the Jackson Hole Ski and Snowboard Club, this swap brings new and used alpine, Nordic and snowboard equipment and clothing to the Heritage Arena, Oct. 24 from 8:15 a.m. to 1 p.m. Pay $1 to register gear and for admission. The club retains a 25 percent commission, which benefits their scholarship fund. Early bird admission at 7:30 a.m. is $10 or $5 with your ski club membership card.